The world is changing, and it is a fact.It is not even debatable – all of us feel it and acknowledge this fact. From our social construct to our atmosphere, everything’s remolding. We are a part of it, part of this change. The drastically changing environment has a huge impact on us. Countries are in search of their true potential where they are confronting the possible damages of an atmosphere full of killer particles. We have seen countries making vows that one day they will make the atmosphere clean again. One of the major agreements that are done to overcome the uncertainty of our future and the environment is the Paris agreement. The major goal of this agreement is to keep the Earth’s temperature below 2°c and the main reason for setting up this goal is to let the temperature increase not influence the biodiversity in any way; as we have seen the major cyclones in the past. A flood of challenges shakes my brain when I think about implementing the Paris Climate Law on the underdeveloped countries as like my own: Pakistan, where everything has been made political, where our environment has become much polluted but nobody is batting an eye except some of the people who are aware that we as a people are going to lose this war without even noticing the presence of it. Recent studies show Lahore as one of the most polluted city of Pakistan. We Pakistanis have always been number one on the list of blaming.When we bash India on the smog episode of last year, we often forget that India is way ahead of us in stabilizing their environmental crisis.Recently France granted India 3.5m Euros to control carbon emissions. A partnership between the government of India and the US between 2009 and 2016 organized $2.5 billion from the American private sector for clean energy projects in India. While for initializing the Paris agreement, Pakistan was granted $150 million,but we can look at the current state of our departments to establish analysis for mitigation of the emissions and to provide the people with a safer environment. Currently the most actively working company that is contributing in mitigating the pollution around the city is Lahore waste management company, but we must consider that this company is partially funded by Turkey. Question: what has the government of Pakistan done to implement the Paris Climate Law? The demand of Paris Agreement is very impactful. We know that with the advancement of science many people have come to know about different scientific terms while the frequently used term is “Climate Change”. Climate change is not something out of the fictional story – it’s a fact. Climate change has affected many people’s lives and if this phenomenon is not addressed then many more will be destroyed. In the past, people were not aware of the consequences of their acts, e.g. coal burning, excessive use of fossil fuels and deforestation etc, but the current generation has to face the deeds of the generation that is gone. Climate change has been the major topic that is talked all over the world –from the world conferences to a simple household. How the society is dealing with climate change is often neglected. And what does climate change offer us?Of course, it offers destruction and chaos in a very certain way. The people who are underprivileged have to face cyclones, floods, crops destruction, livestock destruction. The recent demand of Pakistan’s sustainability goal is to let the government notice the issues that are at their apex. Recently, the safe water project in Punjab owes the national treasury about 965 million for the 307 plants as reported in 2013; and that was the project only confined to Punjab, most of them are still dysfunctional. But has the government ever considered that the solution of a problem lies not in the post-solutions but in the predetermination of an issue? It is obvious that the government institutions do not consider climate change a problem, but rather they indulge in corruption and activities that are unhealthy for anynation. The textile industries along with agricultural sectors are exceeding the NEQ limits that were devised by the government. The Punjab government collects about $26 million grants from China for the projects of pollution free atmosphere and also recently China has contributed 10billion for the electricity power plants – but is the government really depending on its own self? We all know the answer as we all have seen the recent episode of smog in Lahore. The idea of glorifying an issue when it has occurred seems so naïve.After the smog episode has gone, everything is static again – until next year the smog strikes again. Pakistan spends up to $8.78 billion on the defense sector, but funding is reduced to $25 million on environmental sectors all around the country. Now the possibility of future stability can only exist if the government of Pakistan takes precise measures to implement the rules laid out by the Paris Climate Change Agreement. 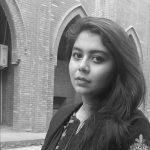 Shumile Fatima is a student of BS (hons) Environmental Science at Government College University Lahore. The main focus of her writing is climate change and environmental justice. I hope more people would take this matter soberly so the fate of the coming generation can be preserved. If we really need a clean and healthy atmosphere then the idea of chaos must be vanished. I commend your efforts to raise voice on this pressing issue. You may want to bring in (perhaps, in your next work) more data and analysis, so that a holistic national approach can be observed. I’ll surely consider your advice.